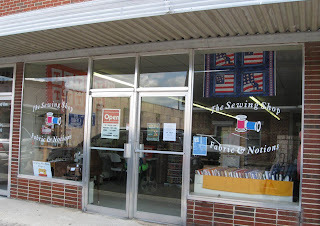 The Sewing Shop in Dayton, Tennessee. 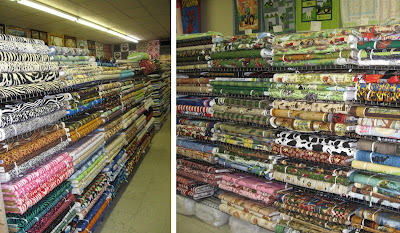 For quilters and sewers in the Chattanooga area, you may remember Swafford's fabric store in Dayton (northeast of Chattanooga). 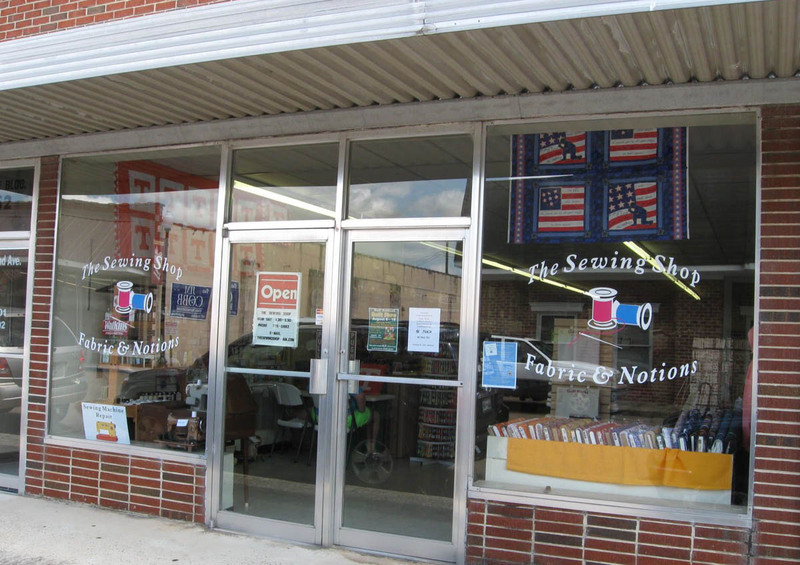 It now has a new owner and has been renamed, The Sewing Shop. Regina, the store's new owner, is a long time friend of the previous owner's family, and when fate intervened, she bought the store and became the new owner. The Sewing Shop is located in historic downtown Dayton, Tennessee, a block away from the Rhea County courthouse. This courthouse was the scene of the famous 1925 Scopes Evolution Trial or "The Monkey Trials." 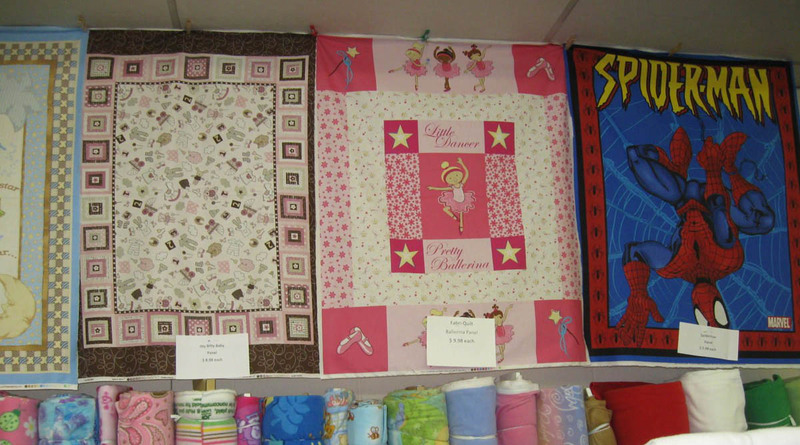 The Sewing Shop has fabrics for sewers and quilters alike. 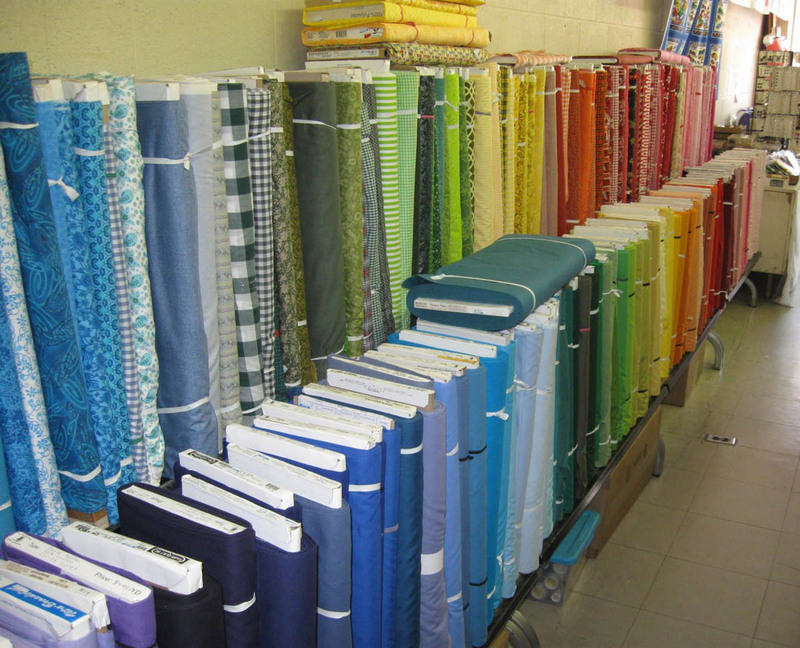 For garments, there are wools, suitings, broadcloth, blends, linings, and fabrics for dressmaking and formalwear. 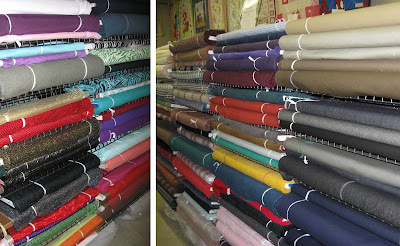 Bolts of wools, wool blends, linings, satins and fabric for garment sewing. 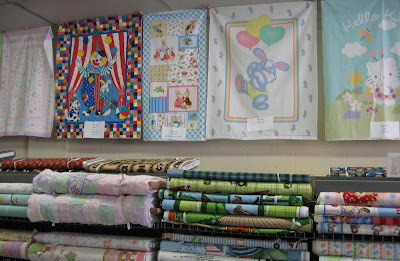 For the quilters, there is a large selection of fun novelties, plaids, stripes, small prints and florals and even pre-printed yardage with quilt block patterns. 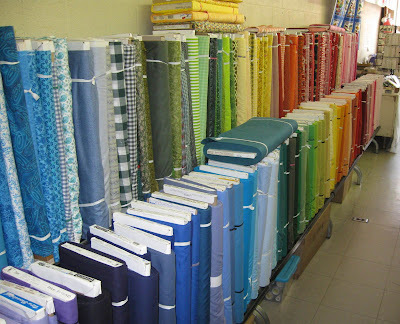 For those who have taken my Introduction to Free-Motion Quilting class, you know that practice is one of the keys to getting proficient at machine quilting. May I suggest investing in a few yards of pre-printed (cheater) cloth? Take some home, drop the feed dogs, and have a go at your free-motion quilting. Cotton novelty and animal prints. Above the shelves of fabrics, there is a large variety of pre-printed panels for baby, toddler and children's quilts and home dec projects. A good selection of fleece is available as well. Ribbons, trims, zippers, and other sewing notions are in good supply as well as needlework kits with a vintage flare. When was the last time you relaxed with some hand embroidery? 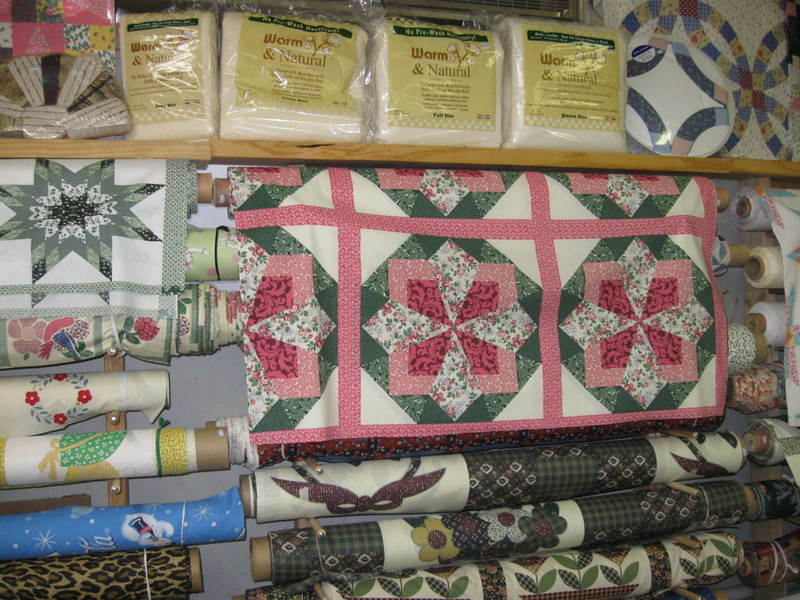 Maybe some embroidered pillowcases, a tablecloth or a few quilt blocks might interest you? 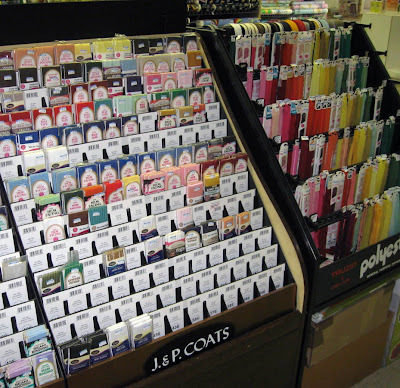 There are kits with a variety of pre-printed designs on the shelves. These handwork projects are portable and can travel with you anywhere. Ribbons and trims are displayed beside kits for hand embroidered linens. 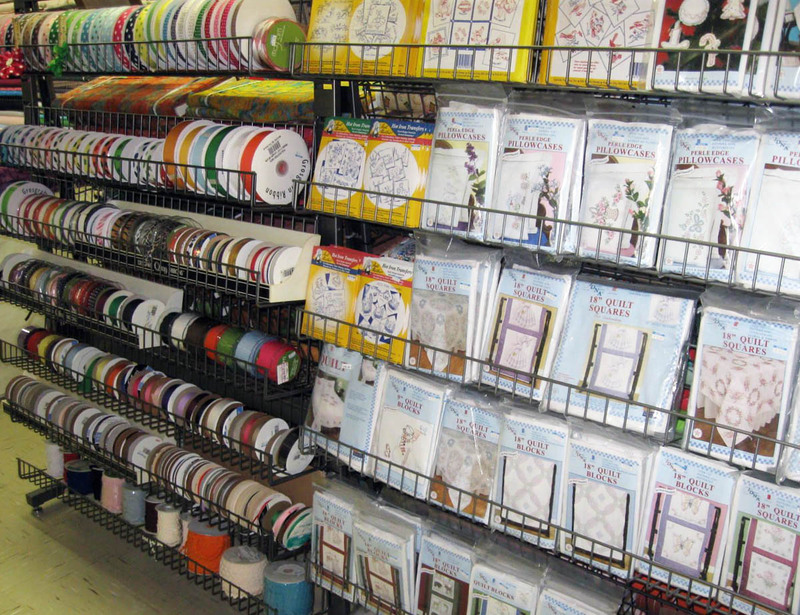 Seam bindins, zippers and other sewing notions. For quilters following the "modern quilt" trend, the selection of cotton solids is amazing! There are two rows of bolts in a gradation of tones that span the rainbow, including grays and neutrals. 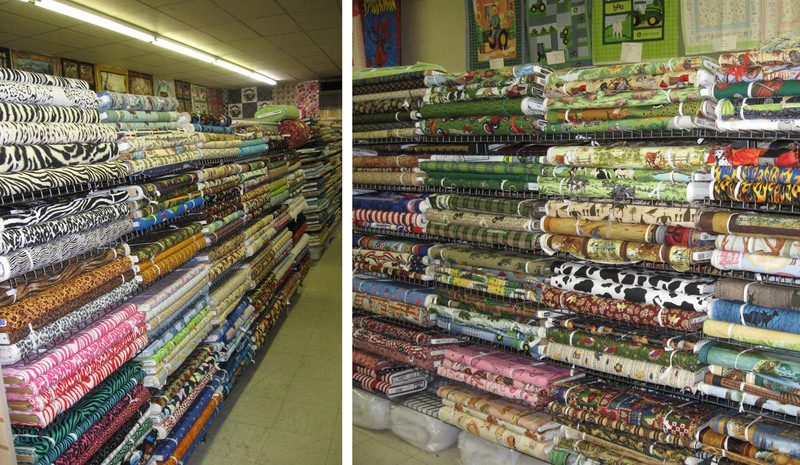 Regina says the solids are quite popular and she is diligent with keeping a full stock. Solids in an extensive range of colors, values and tones. I couldn't get out the door without picking up a few to beef up my collection. So, be careful! The solids will call out to you. 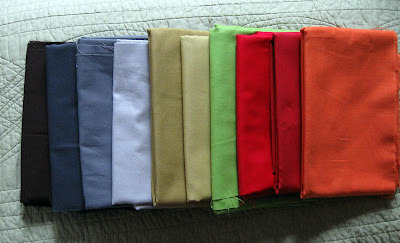 I added these solids to my stash. Wow! Rebecca has whipped that little shop into shape! 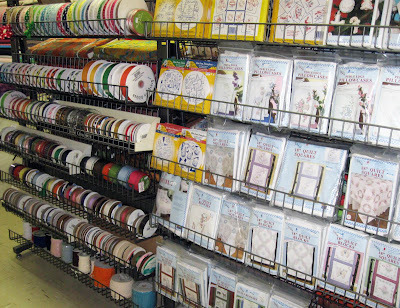 I'm so happy to know that there is a source for quilting supplies in my neck of the woods again. Thanks for the update.